Are you looking to make a career out of driving Heavy Goods Vehicles? If so, get in touch with Wayside Transport today and book your place on an HGV driving course. With years of experience and a wealth of certifications to our name, we can train people of all skill levels to be safer, more competent drivers. With our HGV driving courses, you’ll be ready for anything! Whether you’re looking to take your first step to obtaining your license or are interested in starting your own transport business, our HGV driving course is essential. Here at Wayside Transport, we provide LGV training that is both fast and straightforward. We supply you with the relevant knowledge in manageable chunks so that it is easier for you to process. With the demand for HGV drivers as high as it is, now is the time to get started. Our HGV driving course will lead you into a career that could pay you up to £30,000 per year. If you would like to know more about our HGV driving courses, have a read on further. How can Wayside Transport be of assistance? Our HGV driving course is ideally suited to anyone who gained their driver’s license after 1997 and would like to drive Heavy Goods Vehicles over 3,500kg. Often referred to as a Class 2, Rigid or LGV license, the HGV license is your ticket to a bright new career. Once enrolled on one of our HGV driving courses, you will be under the careful guidance of one of our DVSA accredited driving instructors. At Wayside Transport, we recognise that everyone has different ways of learning. Before you start, our instructors will ensure that the training has been tailored to your particular skills and abilities. Our HGV driving course is intended to build on your existing road knowledge by teaching you the fundamentals of operating HGV’s. You will be guided through a range of scenarios, and we will even provide you with advice and assistance in filling out the forms to obtain your provisional. Best of all, our HGV driving courses are available at a wide selection of testing centres across the South and South-West of England. Wherever you’re based, pick your nearest centre, and we’ll get everything setup for you. In addition to our HGV driving course, we also provide shunting training which is an invaluable skill for any HGV operator to possess. Shunting is the process in which trailers are pushed and pulled around a site with the intention of being loaded or parked up. If a driver is unaware of the correct safety procedures and is attempting to shunt trailers on unfamiliar premises, accidents can occur. Even at low speed, the risk both in terms of injury and property damage can be substantial. At the conclusion of this one day course, you’ll be able to handle any shunting situation with absolute confidence. Training can be held at your premises and includes full practical demonstrations by our team. With our shunting training, you will finish our HGV driving courses with a well-rounded knowledge of handling Heavy Goods Vehicles. If you’re looking for professional HGV driving courses delivered by a friendly, down-to-earth team, look no further than Wayside Transport. While many companies will overwhelm you with unnecessary jargon, we do things a little differently. Our forward-thinking approach instils in you the essential knowledge in a way that is easy to digest. We tailor our techniques to the individual to help you gain a complete understanding of operating HGV’s in a safe and competent fashion. We work alongside you throughout, working to improve your knowledge through the use of tried and tested techniques. 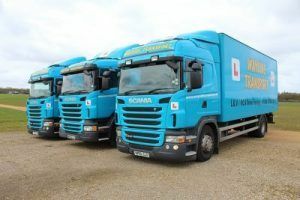 Our proven track record for successfully training countless drivers is why our HGV driving course is widely recognised across the South and South-West of England. Whether you are looking to learn how to drive a minibus, pull a trailer with a car or drive an HGV, we give you the practical experience necessary to succeed. Best of all, our HGV driving courses are the most affordable around. We regularly benchmark our services against those of our competitors so whether you’re an individual or an organisation, we have a package that is right for you. If our HGV driving course is of interest to you or your company, get in touch with Wayside Transport today on 01202 873 911.